I've been baking this morning, and happily made up a batch of Apricot Jam Muffins. It's likely there won't be any left by tomorrow. As promised, I've gathered pictures of a few quilted items that I made before Christmas. Two sets of items are just too hard to get photos - darn my propensity to forget the happy snaps!! Please excuse the hurried and badly lit picture - I grabbed this as Mum, Amy and I were heading out for a Costco/Ikea shopping adventure! I also made two spiderweb placemats in red and green reproduction fabrics - one each for my two hairdressers. Yes friends, it takes a village to keep me looking this fabulous :-) But of course I didn't remember to take a picture of them either! There was another one spare, and I quickly bound that and presented it to Shay when she came over to help with the Gingerbread adventures! I'm thinking that's all the pre-Christmas quilting that I managed to get done, and I'm sure it's plenty! Jam is easy to make, and so far I've only used 3kgs of fruit for our jam - I'll make more tomorrow I'm thinking, and probably give lots away. I just love that jam funnel in the picture there - it's one of the handiest tools I've ever purchased - saves so much mess! I always sterilise more jars than I'll need - it's a drama to race to find more jars if I run out. And here are the results of my work for this afternoon. I'm just loving the cute Masons jars I found at a local discount store. There will be more of these in my future, and I'm going to put all my other old glass jars in the recycle bin. I'm finding the cellophane lids just aren't keeping the jam as fresh as they could. 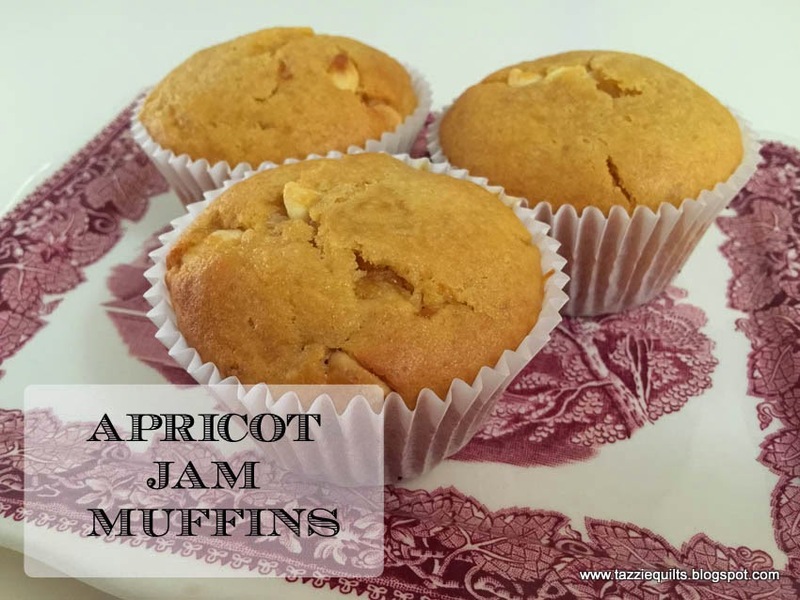 There is still a decent amount of jam from last year left over - another thing on the agenda tomorrow is to make some Apricot Jam Muffins - they are really tasty and DH loves them. When I have an opportunity I'll share the recipe. I think they would be great to use up any kind of jam. Just a quick note to let you know that I'm having a little sale in my Etsy Store - it runs through to the end of January 2015. First up, Merry Christmas/Happy Holidays to all my lovely blog readers. Things have been super quiet here on the blog - but in my home it has been crazy busy. Getting ready for Christmas Day is always super fun, but it really makes a girl busy in pretty much every hour of each day. I had a lot of Christmas sewing, shopping and cooking to take care of, and I've taken a few pictures, but I won't share them today - I forgot to take a couple of pictures of some gifts I made, so I'd like to track them down and share soon. I just loved putting it together, and it was so much fun to have Shay's help. This year I had planned a much more elaborate construction, but I didn't really leave myself enough time. This colonial style house is my favourite stand by, but I think I'll have a go at the fancy house while I'm on holidays - and Marty says he's going to help too! Laziness and lack of time meant that rather than used crushed up boiled sweets to make the windows, this time I used cut up gelatine sheets and glued them in place with icing. IMHO it looks really good, and the criss-cross pattern gives it a leaded glass look. As I always do, I've used a little battery operated string of LED's to light up the interior. Next year we're thinking we might make up some furniture and a Christmas tree to put inside. How fun! Should you like to have a go at making your own gingerbread house, I've put my favourite gingerbread and royal icing recipe on my website as a free download. I haven't put a template up there yet, but I will work on a simple one for you. Just give me some time. Have fun and let me know how you go! Just over two weeks until the big day! Can you believe there are only just over two weeks until Christmas? I bet you've all got your list prepared and are well on the way to completing your shopping. I really wish I could say the same - I haven't made a list, and I've only bought one present - and that's only because my sweet brother gave me the coordinates of the exact thing he wanted. I strongly dislike being so disorganised in this way, but for some reason I just can't get my head around the Christmas list until Amy's birthday (which is this weekend) is sorted, and then I run at Xmas like a crazy lady! One of these days I'll take the time to learn how to take better pictures with fancy effects, but not today :-) You can see though how completely full the tree is ... there's barely room for another single ornament, and that's how I like it! Note to self ... straighten those faux candles ... très messy. We made another quilt shop stop so Vicki could pick up a particular batting she was after, but I didn't break out the credit card at all. And before we stopped for lunch, we headed into some particularly dangerous territory ... The Christmas Shop on Goodwood Road! Goodness me, my mettle was tested when I was faced with this wall of Nutcrackers! I have no clue how I managed it, but I didn't buy any of them ... though I was sorely tempted by the wind-up guy in the middle with the red base. He's so very cute. I just loved these glass ornaments, they're very regal looking. It would have been nice to have a bunch of them, but the tree is groaning already. Also, I'm TRYING to practice restraint as I've put some Christmas funds aside to hunt down a new tree in the post-Xmas sales - ours is starting to look a little spindly and I've been 'gunna' replace it for a few years now. And the fabric on the right is a gorgeous linen. The moment I saw it, I knew it would be perfect to make up a wrap skirt. I purchased the pattern from The Drapery when they were at guild not so long ago, and I've been looking for the perfect summery fabric ever since. I wanted to share a pic of the pattern with you, but my cutting table is such a mess that I can't put my hands on it right now. So, click here to check it out.